April 22nd is Earth Day an opportunity to make small changes to our eating habits to contribute to a healthier planet. The first Earth Day was held on April 22, 1970 (here’s the history). It led to the creation of the United States Environmental Protection Agency, the passage of the Clean Air, Clean Water Act and the Endangered Species Act. Forty-seven years later, the need to save the planet is even greater. You’ve heard all this before; but if you make even one of the following changes, you’re helping the cause. Here are 10 little changes you can make. Pick [at least] one! 1. Add more plant-based protein into your diet. Industrial farmed meat has a higher impact on the environment than any other food group. For a healthier and more environmentally friendly protein, try beans, legumes, nuts, and seeds instead. Meatless Monday only goes so far: If you consume cheese or other dairy products, they still come from animals that require deforestation and excrete methane, a greenhouse gas. Smaller portions of meat, larger portions of vegetables and grains. Aim for two veggies at lunch and dinner (a salad counts as one). You don’t have to have a diet of 100% local food; in fact, if you drink coffee or tea or eat bananas, it’s pretty impossible. But seek out local foods when you can, or at least those grown and made in the U.S.A. (photo #2). It’s the best way to lower your carbon footprint. Bonus: Locally-grown crops are typically fresher and often taste better compared to foods that are shipped across the globe. This is a corollary to eating locavore. Foods that travel across oceans are often those from the southern hemisphere that are out of season in the northern hemisphere. 4. Eat more raw foods. You don’t need to embrace raw foodism; simply enjoy more raw fruits and vegetables. 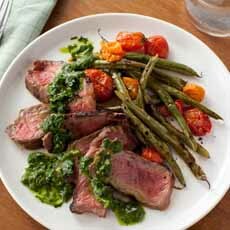 Less meat, more veggies: better for you, better for the environment (photo Tara Donne | Food Network). 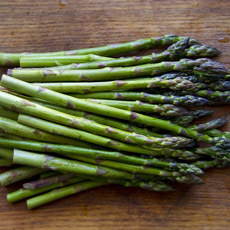 Americans demand asparagus year-round; but except for spring’s domestic asparagus, it’s shipped in from Chile (photo courtesy Baldor Food). 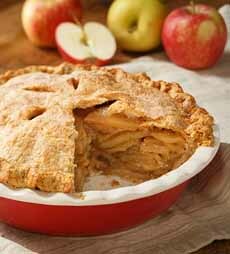 Apple pie: tempting, but… Fresh apple: better for you, better for the environment (photo courtesy U.S. Apple Association). The environment benefits by the savings on energy to cook the food, as well as the packaging of, chips and cookies. You benefit from all the hydration and nutrients in the raw fruits and veggies. Make double batches when you cook, so you’ll have leftovers for another meal. Even though you might need to reheat the food, even freeze it, the net energy saved is tremendous. 6. BYO Bags & Containers To The Store. We always have two fold-up nylon shopping bags at the bottom of our backpack or purse. They come in endless colors and patterns, and you don’t have to take bags from the store (photo #4). If you want large-haul reusable bags, we like these collapsible boxes (photo #5). Embrace reusable produce bags (photo courtesy Bekith) and  grocery bags and boxes. Look for foods with the least amount of packaging. 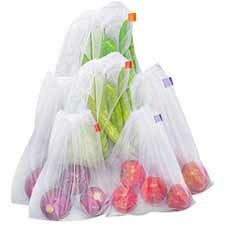 While cardboard boxes can be recycled, certain types of plastic cannot be—including the plastic produce bags. You don’t really need them: The cashier will weigh your fruit or vegetables without a bag. 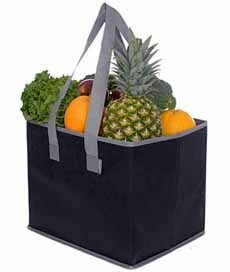 But if you prefer the convenience, get a set of these reusable produce bags, which go from shopping cart to refrigerator. Yes, this might keep your food fresh and protected, however the excess packaging only ends up in landfills and adds more pollution to our land. Try buying produce that is not in a package. 8. Carry water in a reusable bottle. 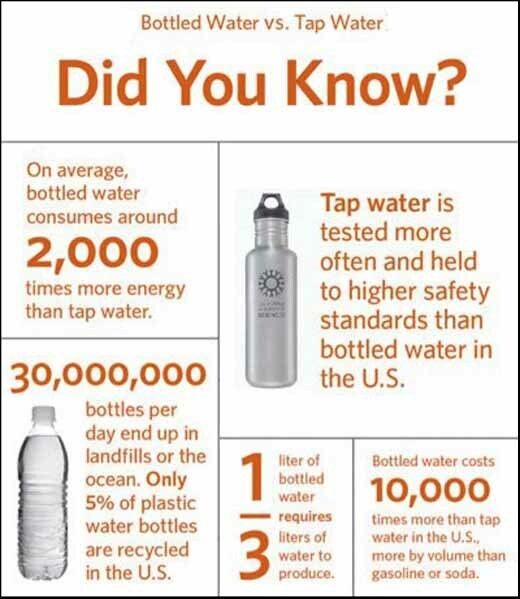 Bottled water doesn’t necessarily mean its cleaner or better for you than tap water. Look for a filter system to install in your kitchen sink or even a water pitcher filter will work well. The fewer disposable plastic bottles we use, the cleaner our planet will be. There are so many attractive, efficient, reusable water balls on the market. Just pick one and use it! If you buy bottled water because you don’t like the taste of your tap water, consider a faucet-based, countertop or under-sink filtration system. If you do need to buy a bottle of water, bring home the empty and refill it. Give it a life beyond Day 1. See the infographic below and the bottled water crisis. If you drink a lot of carbonated beverage, you’ll save on empty bottles and lugging both, with a Sodastream carbonater. The flavors are delicious and the carbonation units are recycled. We do purchase fresh prepared foods packed in plastic containers, but we reuse those containers for everything from leftovers to storage.